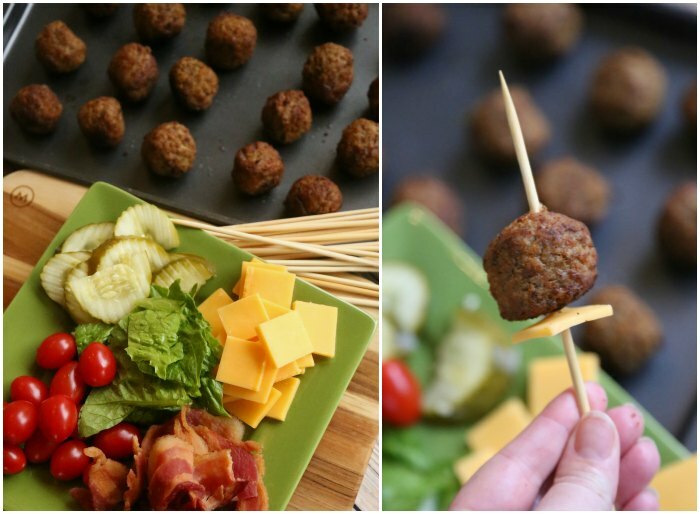 We’re sharing these fun cheeseburger meatball kabobs (sponsored by Cooked Perfect Meatballs) with you today, perfect for a fun game day appetizer! 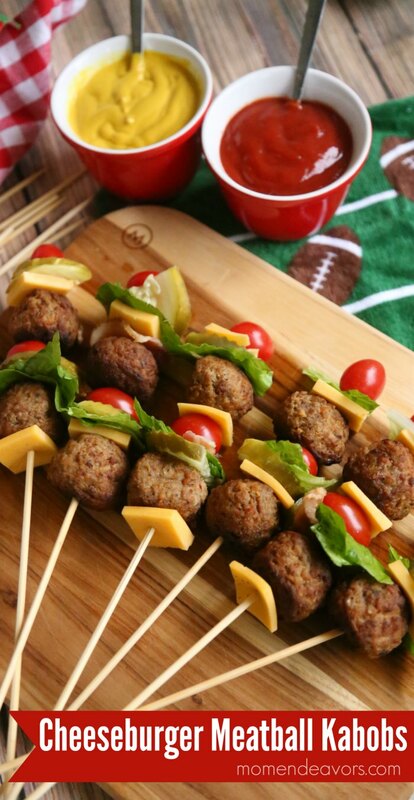 Food on a stick always seems to be a crowd favorite – especially for parties and football game watching. 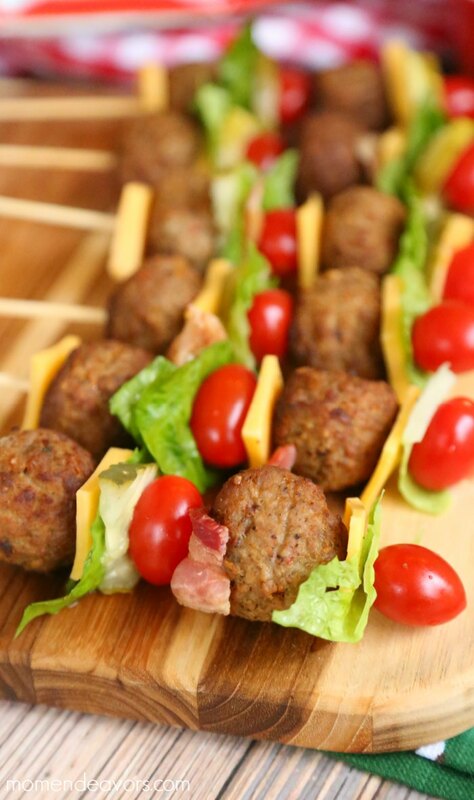 We’ve made fun sandwich kabobs before, so why not some simple cheeseburger kabobs?! 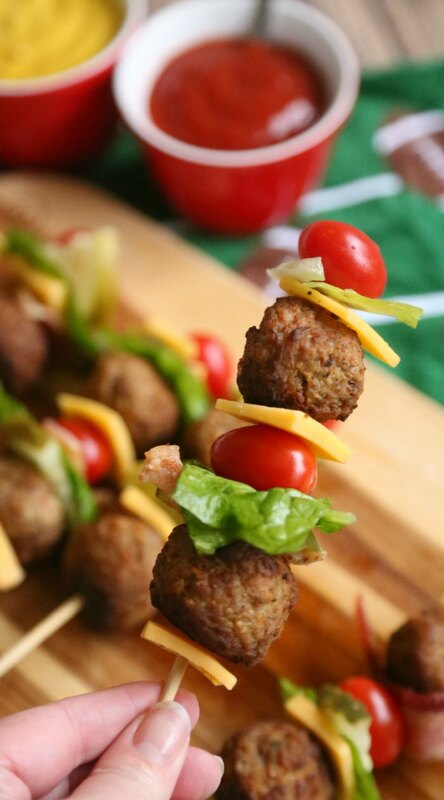 The result is fun and the perfect “finger food” for game day festivities! 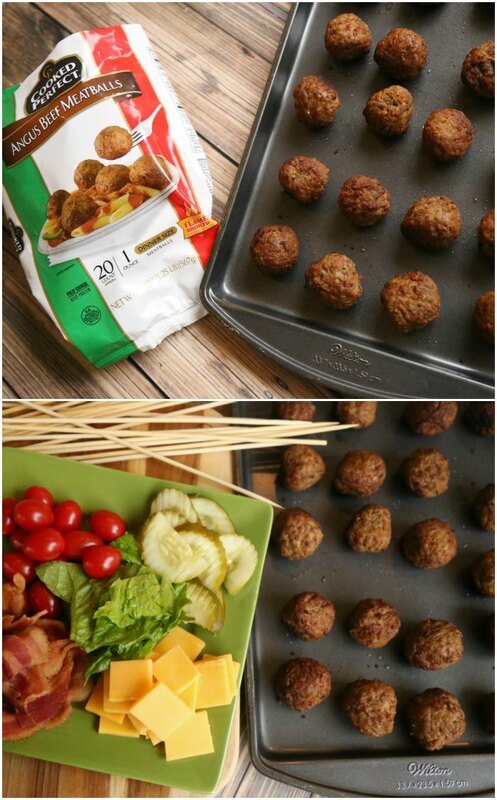 Using Cooked Perfect Meatballs makes these kabobs SO easy and tasty! Cooked Perfect Meatballs are crafted using select meats, real cheeses, and savory herbs and spices; then flame-broiled to sear in the flavor. We chose the Angus Beef variety for this recipe (perfect for that “cheeseburger” flavor), but there are a various flavors to choose from – Italian Style, Gluten Free Italian Style, Homestyle, Turkey, Swedish, Chicken, and Sweet Italian (you can use the store locator here to find out where to buy your favorite variety). Since the Cooked Perfect Meatballs are already cooked and full of quality flavor, it makes it a breeze to serve them up for your game-day parties! To make the kabobs, you’ll prepare the meatballs according to package directions. If you use the oven method like we did, it will take about 20 minutes. During that time you can prepare the other ingredients. Once the meatballs and other ingredients are prepared, then you can build the kabobs! Slide your ingredients onto the skewers in any order, place on a tray to serve, and enjoy! So fun and so super tasty!!! They really are perfect for game day! And now for some extra game day fun, you can head over to Cooked Perfect.com/GameDay for a chance to Win The Ultimate Football Party Package!!!! You could win one of five weekly slow cooker prizes or “The Ultimate Football Party Package” Grand Prize which gives you $2,000 in gift cards to purchase a Flat Screen “Smart” TV, Deluxe Recliner, and Coffee Table, along with 5 Cooked Perfect Meatballs free product coupons and a Cooked Perfect cutting board! Wouldn’t that grand prize be a SWEET win?! You could enjoy some cheeseburger meatball kabobs while lounging in your new deluxe recliner! NICE! So hurry and enter! NO PURCHASE NECESSARY TO ENTER OR WIN. A PURCHASE WILL NOT INCREASE YOUR CHANCES OF WINNING. Internet access and a valid e-mail address are required to participate. Open to legal residents of the 50 U.S. and D.C., who are 18 years of age (19 in AL and NE; 21 in MS) or older. Promotion starts on 1/3/17 at Noon ET and ends on 2/6/17 at 11:59:59 p.m. ET. To enter, visit www.CookedPerfect.com/Gameday (the “Website”) and follow the instructions. 5 WEEKLY PRIZES (1 each week): Approximate Retail Value (“ARV”): $63 each. 1 GRAND PRIZE: ARV: $2,080. TOTAL ARV: $2,395. Odds of winning depend on the number of eligible entries received. Void where prohibited. For Official Rules, drawing schedule and prize details, visit our Website. Sponsor: Home Market Foods Inc., 140 Morgan Drive, Norwood, MA 02062.